I've never cared much about the Home Run Derby. In the past I might have watched it in passing, with Chris Berman's grating 'back-back-back' calls muted, but it's never been destination viewing for me. Last year, that changed. After running a baseball practice on a Monday evening in July, I raced home to catch the majority of the event. Following his breakout first half for the Twins, I needed to see Miguel Sano's majestic power on the national stage. Boy did he deliver. And boy, does that night – somehow less than one year ago – now feel like a distant memory, as Sano's ensuing regression has led him back-back-back to Single-A. At Marlins Park, no one could keep up with Aaron Judge and his inhuman display of strength. But Sano came close. He edged Mike Moustakas and Gary Sanchez before facing off against Judge in the final round of the Derby, ultimately coming up a little short. The view from Minnesota was blindingly bright. As Sano leisurely slugged baseballs far beyond Miami's outfield walls, he grinned and reveled in the moment, looking as natural in the spotlight as he always had. Having carried into the All-Star break 21 homers and a .906 OPS, there he was, alongside Judge, two young stars of the game basking in their glory. The best part? It seemed as though we were only scratching the surface. Sano was a year younger than Judge – still just a 24-year-old gaining comfort and familiarity with major-league pitching. The sky was the limit. But instead, the sky has fallen. Sano's collapse has spanned three dimensions: his performance, his physical condition, and his attitude. While it's tough to know exactly how to weigh each individually, it seems clear that all three are problematic, which helps explains the organization's drastic reparative measure. Since the 2017 All-Star break, Sano has batted .206 and slugged .416, striking out at a 40% rate while watching his once-pristine walk rate drop to an utterly mediocre 7.9%. The power is still there, and occasionally evident when he manages to guess right and get a hold of one, but his approach at the plate has completely unraveled. Before his demotion, Sano was an immensely easy assignment for opposing pitchers, who were by then executing the "get ahead and spin it outside" formula so consistently it brought about deja vu. Defensive metrics rated his glove as terrible. He lumbered around the bases sluggishly. Overall, he was a sub-replacement level player. Sano's weight has been a subject of public scrutiny since at least March 2016, when Patrick Reusse called him out in the Star Tribune. "He is heavier this spring than last," Reusse wrote. "He is at 270-plus when the Twins were hoping to have him at 260-minus as they go forward with the plan to play him in right field." Oh yeah, that plan. That great, brilliantly conceived plan. Anyway, by the end of 2017, Sano's weight had reportedly risen to 290-plus, and he was in the same range this spring. Many factors have contributed to his burgeoning bulk – diet, downtime recovering from injuries, and natural genetics all likely play a role – but there's no denying the trend. Sano's size has unquestionably affected his play, and has very likely affected his ability to stay on the field. It's not unheard of for a player to miss six weeks due to a stress reaction (as Sano did late last year), or a month due to a hamstring injury of mysterious origin (as Sano did early this year). But for both to happen in such quick succession, for a player whose physical conditioning already had become a known issue, is conspicuous to say the least. 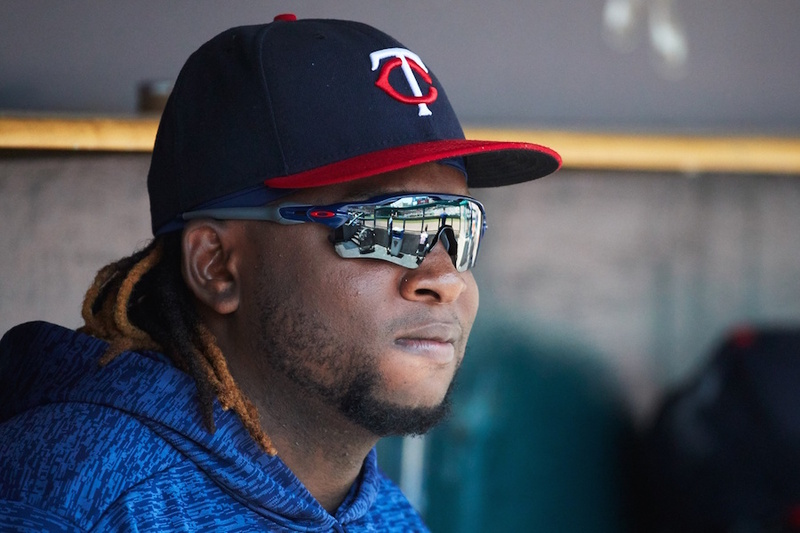 When Reusse took Sano to task for showing up at camp larger than expected in 2016, he wasn't just reporting. He also included some insinuations and barbs, suggesting that a lack of commitment and maturity on the slugger's end were partially to blame. Fellow Strib columnist Jim Souhan followed suit in a similarly toned piece last August, asserting that a hefty Sano needed to show some dietary discipline. I'm not the only one who found these digs irksome. Never did I doubt the veracity of the reporting, in that Reusse and Souhan were relaying actual concerns that existed within the organization, but was it necessary reporting? Internal rumblings about perceived character weaknesses in the past have eventually led to some unfortunate narratives and very bad personnel decisions. It all felt very gossipy. Unfortunately, no one can deny that the grievances aired through Reusse and Souhan appear valid in retrospect. Even as someone who has tried to give Sano the benefit of doubt at every turn, I can't ignore the insurmountable evidence of a man who just doesn't get it. Whether or not these should be perceived as "character issues" varies based on who you're listening to, but without question Sano's troubles are to some extent his own doing. Anecdotes like this one from Mike Berardino speak well enough to that. At best, Sano has been aloof and passive at a time where he needs to be working diligently to regain an edge. Hopefully the latter is now occurring in Fort Myers. It's so strange, this state of affairs: When he was last playing for the Miracle in 2013, Sano was a rising 20-year-old superstar, posting a 1.079 OPS during a brief 56-game stint en route to Double-A. Five years later he's back there, a broken and banished oddity. On Friday night, as the surrounding Fort Myers hitters teed off for 20 hits, five homers and 14 runs around him, Sano went 0-for-4 with two strikeouts as the cleanup hitter. It's one game, yes, but it seems to say a whole lot. Perhaps down the line we'll look at this current juncture as the rock-bottom point in his playing career, instead of looking at the fleeting memory of that All Star weekend last summer as the high point. Ouch. How many years of 90+ losses have we endured. During that time I always looked to 2018 as the time the Twins would be a contender. We've just had so many busts though. It's hard to see the light at this point. We're the knew KC Royals. Hopefully we can put it together for a year and win a title like they did. Have ahd busts from a decade of draft picks. Numerous trades have gone south, where we thought we were getting the futue (especially in pitching), but didn't. Free agency was played safe, or overpaying for basically replacement level guys, instead of taking the big plunge (not to say that is the end-all, as it is a risk, too). And Sano. Can he improve? Will he become the next Oswaldo Arcia? Did the Twins miss out on possibly trading him this past off-season for some value? Of course, players can still turn around. We hope Buxton and Kepler find the light. We hope Polanco is something. Can I "unlike" this topic, despite its quality? I have no idea if the RF move was the cause or contributed to his "deterioration", but it seems the beginning of it. Did he resent the move to RF? It would seem so. There doesn't seem to be any anecdotal evidence that he prepared in the off season, either on the field, or in the gym for his new assignment. He chased fly balls with all the enthusiasm of a 6 year old cleaning his room. It's true he did hit for awhile, but his conditioning started to catch up with him. As for this season, no matter the rationale extended, just one look at him this spring made it apparent that he didn't spend the off season at AnyTime Fitness. He might just be the player who needs to hit rock bottom before he can see the light. I just hope I am wrong! What a shame if Sano really wastes all that talent and doesn't rebound from this. Biggest flop in Twins history as of now. There is still time to salvage his career. His response to this demotion seems critical. I appreciate the non-conventional approach. I hope the Twins follow this up with a life coach for a while. And finally... I believe with all of my heart that Sano will not feel like a bust when he stops swinging at crap. One can only wonder if the last half of 2017 and making the playoffs did more harm than good for the young players. Did they go into the off-season thinking we have made it?We are good and don't have to get better? Or was the last half of 2017 a fluke and these guys really aren't that good? It is safe to say Rosario, Buxton, Kepler, Sano, and Polanco are the cornerstones of the Twins rebuild offensively. Right now, it is in deep trouble. This is a good article on Sano, but Sano is just part of the problem. I like the approach the Twins are taking with him right now. As Brian said above, he could probably use a good life coach or mentor. I think most of this is mental. Sano seems to be a smart guy and has a natural talent for baseball in general. I loved to watch him work the pitchers two years ago. His confidence has obviously been shaken. Time to find his groove again. Maybe it is something simple. Does he need glasses? Maybe he isn't picking up the spin on the ball as it leaves the pitcher's hand. Maybe he doesn't see the pitch location soon enough. Maybe the dinner portions look smaller than they really are. I'm hoping that this gets fixed in Ft. Myers. I'm hoping that the Twins give Sano the same medicine that they gave Joe Mauer in 2009 when he started the season in Ft Myers and rejoined the Twins in June for 5 months of the best hitting the Twins have ever had. I'm hoping that Sano returns to the Bigs and carries the Twins to a pennant. Hope is all I have left in the 2018 season. When I get frustrated with the Twins and the current mediocrity, I have to remind myself that, yes, Sano and Buxton are in the minor leagues and not the leaderboard. Truly a phenomenal swing of the pendulum. I believe in a human's ability to work through the tough times. They both have the talent. If Sano can find his way out of these woods, he will be a fearsome sight to behold. I was always very anti - Reusse and this notion Sano was fat. He's always been just a big human and it didn't seem to be negatively affecting his play. And then this Spring came around and I saw Sano in a game for the 1st time and well... he's fat now. I have no idea what his attitude is like, if he still wants to be great or not. But an athlete has a job that is primarily based around their physical abilities and stature.If he doesn't care enough to not be 30 pounds overweight its hard to draw any logical conclusion other than, he doesn't care about his craft. I don't place any fault on the Twins for Sano's conditioning troubles.No-one is forcing him to eat poorly and by the time you reach the majors you know the stakes (regardless of where your from) and the importance of keeping yourself in good playing shape.That is universal in all sports be it the NBA, NHL, MLS, etc. Yet we still see athletes in all sports that struggle with conditioning.It's a shame because he is a rare talent and a strong human being.But that said no-one is shoving food down his throat and or forcing him gain 20+ pounds in the offseason, that's on Miguel. He bears most of the personal responsibility in this regardless of what position he plays in the field. Let's hope he and the Twins find a way to turn things around. Because without Sano and Buxton performing at near superstar levels, I don't see a way out of the wilderness in the foreseeable future. If only we had just Sano to worry about, but their is a guy on the opposite side of the bathroom scales who is flailing away in AAA when we need him running the bases in MLB and he looks lost with a positive attitude.And after those two get fixed we have a German in the outfield who is slipping down to below replacement batting when we anticipated another rising star.And then we have our oldest star showing a valient, but seemingly futile effort to combat concussions, our young star short stop taking a PED vacation, and our slugging 2B waiting for his half year magic to kick in. That is a lot to deal with - not even moving into Belisle, Pressly and the BP. I have wondered what effect the Home Run Derby has on hitters. Certainly, Sano has many issues but perhaps this could be one. I remember past participants having real trouble with their swings and timing after participating in the derby. With a guy like Sano, that could really be detrimental. Added to that, it could have given him a truly erroneous view of himself and his abilities. Just one more pebble thrown on the rock pile. The weird thing is we don't even really miss Santana as much as you'd expect. Our starting pitching has been more than adequate to compete. Jason Castro isn't really a wizard with the bat either, so I don't see how losing his .231/.311/.386 affects the offense that negatively. Sano/Buxton/Kepler/Polanco/Dozier/Mauer/Morrison/Rosario/Escobar are where the bread gets buttered around here, and only 2 are performing consistently. No effect. To the extent that players have attributed effects to the home run derby, remember these are the same players who believe certain necklaces help their performance, that bunting against the shift is wrong, that umpires are holding back their performance relative to their peers, etc. There's nothing they won't use as an excuse or explanation for normal statistical variance. After the all-star break in 2017, Sano was largely the same hitter he was in May and June of that year. The outlier is pretty much April, and pretty much in the power department. As they found ways to neutralize his power, the walks receded too. If we had Ervin Santana, that pretty much would have bumped Romero, who's been passable. If you trust the ZiPS projection for Ervin, maybe a difference of 1.5 wins so far? Castro was replacement level before his injury. His replacements have been right around replacement level too. He was worth ~2 WAR last year, so maybe a win if you buy that as his true talent level? Hard to see too much tangible difference in intangibles yet either -- the pitching has improved overall, despite the absence of Ervin. With the 2018 season gone, I can agree with the Twins taking these drastic steps to attempt to reclaim an asset.At this point, I don't think the Twins should be in a hurry at all.Whatever those things are that are broken with Miguel, take the time to attempt a rebuild from the ground up with the remainder of this season (and the upcoming off-season). Meanwhile, I wouldn't mind a similar approach with Buxton at this point.Perhaps his challenges are narrower in scope than are Sano's.But there's no value in having a center fielder of any defensively ability that hits like a pitcher.And so far, he hasn't come close to handling the AAA pitching he's seeing.Hopefully that changes.But if July 9 comes around and it hasn't changed, it will be interesting to see the decision. I have wondered what effect the Home Run Derby has on hitters. I just don't understand what happens in this organization. We have 3 guys (Sano, Buxton, Kepler) that were hyped to no end as the cornerstones of a long competitive stretch.Other organizations that had hyped players in the same time frame, like the Cubs, Nationals, Astros and Dodgers, had their guys come up and take off. In Minnesota we have 3 busts. Thank goodness for Berrios and Rosario. Let's be honest here. Sano has become Delmon Young, Buxton just can't hit period and the regression of Kepler is maddening.If the next wave of Kiriloff, Lewis and Rooker all bust, then there is something inherently wrong inside this organization. The whole thing is maddening and it's not just Sano. Buxton is flailing away. Almost as importantly, Kepler is regressing, not getting better. That doesn't get a lot of press for some reason, but it's true - Kepler is not helping the team win at the MLB level, he is holding the team back. He looks like he needs to rejoin his OF mate Buxton in AAA for awhile and Cave needs to be given a fair shot to see if he can be a regular at the MLB level and take Kepler's job.What?We have nobody else in AAA to replace Kepler on the roster?Wow. I might demote Kepler also at this point. Promote Wade and give him and Cave shots.... See what you have. This whole thing is a real downer.